On this day in 1997, Pompey dumped Premier League Leeds out of the FA Cup following their fifth-round clash at Elland Road. Terry Fenwick's side went into the break 1-0 up following Alan McLouighlin’s seventh-minute opener with a brave header – his second goal in that season’s competition. The Blues had a golden chance to extend their lead from the penalty spot after Gary Kelly handled in the box. But with regular penalty-taker McLoughlin now off following an ankle injury, the responsibility fell to Fitzroy Simpson. He stepped up to take the spot-kick, only for Leeds keeper Nigel Martyn to keep it out with a dive to his right. 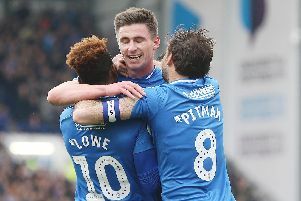 The miss came back to haunt Pompey in the second half when the hosts equalised seven minutes after the restart. Lee Bowyer was played through on goal and he lifted the ball over the onrushing Alan Knight. Mathias Svensson, however, restored the visitors’ lead on 67 minutes, when he cut in from the left and fired home from a tight angle. Lee Bradbury added a third on 86 minutes, when he tapped home from Svensson’s cross. Bowyer scored his second of the game on the stroke of full time. However, there was no time to find a late leveller for David O’Leary’s side as Championship Pompey booked a quarter-final date with Chelsea. Leeds: Martyn, G Kelly, Dorigo, Halle, Radebe, Jackson, Molenaar, Bowyer, Palmer, Wallace, B Deane. Beeney, Wetherall, Rush. Pompey: Knight, Awford, Pethick, Perrett, Thomson, Hall, McLoughlin, Simpson, Hillier, Bradbury, Svensson Subs: Dobson, Allen, Igoe.